I was asked to bring snacks for Max's class. Usually I made the Oatmeal Cookies but I want to bake something different this time. Wes had been asking me to make brownies but I had been wanting to make cheesecake so why not combine them? 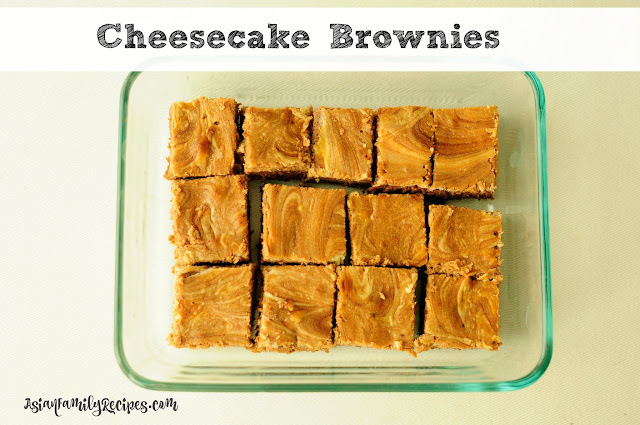 The idea sounds great; who doesn't like cheesecake and brownies? He kept eating some but I don't mind after all the hard work he has done. Make brownie batter: Melt the butter then place it inside a large mixing bowl add the rest of the brownies ingredient as listed. Whisk until well combined and spread it inside the baking pan. Make cheesecake batter: Whisk together all the cheesecake batter ingredients using mixer until smooth. Spoon over brownie batter, then swirl in with a spatula. Bake for 25-30 minutes until the center is set.